Dr. Garbage Bytecode Visualizer – http://www.drgarbage.com/bytecode-visualizer.html – not that old (still in development), very promising plugin for eclipse. It works, but it has some problems and limitations (for example breakpoint can’t be set inside method, only method entry is supported). I was struggling with this topic until a wild idea came to my head. Restoring this one is tricky, as it would require building function graph to correctly assign local variable scope (start_pc, length fields). I’ve decided to simplify it a bit. I’m using information about branch instructions and exception handlers to partition function into small chunks (I’ll not call them basic blocks, but they’re similar to basic blocks). Each chunk is scanned for opcodes that are operating on local variables ( a/f/d/i/l-store/load_<n>, iinc) so I can determine the type of a specific variable. All those information are merged and put together into LocalVariableTable attribute. Described mechanism isn’t perfect, but it should be sufficient in most cases (and currently it’s probably the best (only?) solution to this problem). This is the end of my idea, but it isn’t the end of that topic. Java VM is a stack based virtual machine, which means that most of all opcodes operates on the operand stack. Having information about values pushed onto the stack sometimes can be crucial to understand what is really going on. 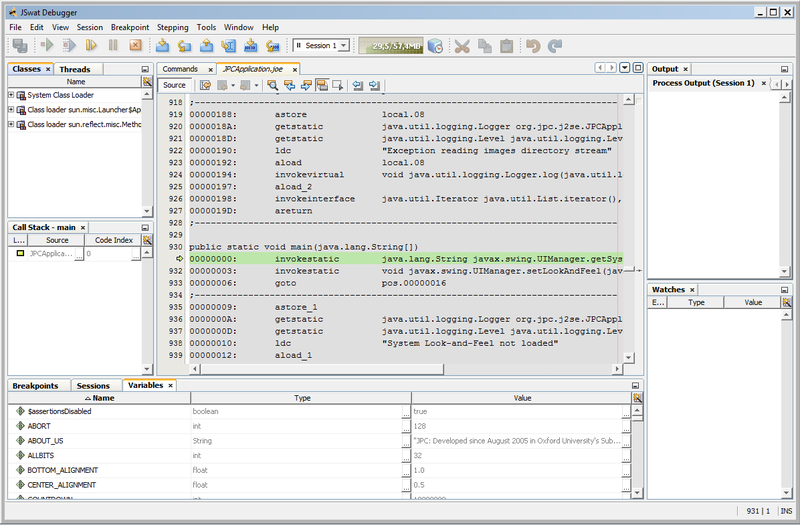 Unfortunately neither JDB nor JSwat supports previewing of jvm operand stack. This is an unresolved problem for now. for /R %c in (*.class) do start /WAIT dirtyJOE.exe /rdi "%c"
start /WAIT is crucial if you don’t want to mess the console, as dirtyJOE isn’t a console application so without this command it will run asynchronously. Most debuggers should automatically pick up generated disassembled source files (.joe), just set the proper sourcpath in the debugger settings. JSwat is even able to load source files from the .jar file, so disassembled .joe files can be repackaged into the original .jar file. Wow, interesting. Can you please post more. Yup, you may try to use dirtyJOE through WINE, it should work. As for the rest of the topic, it’s pretty much platform independent. How get all command line commands ? not sure if I understand, all dirtyJOE command line options are described in the help file.